Video - x200 Containers - What did I get? This video shows 200 containers being opened, and has been made for comparisons, for other World of Warships (WoWS) players to use in their containers returns. This should help WoWS players see the averages in container rewards. 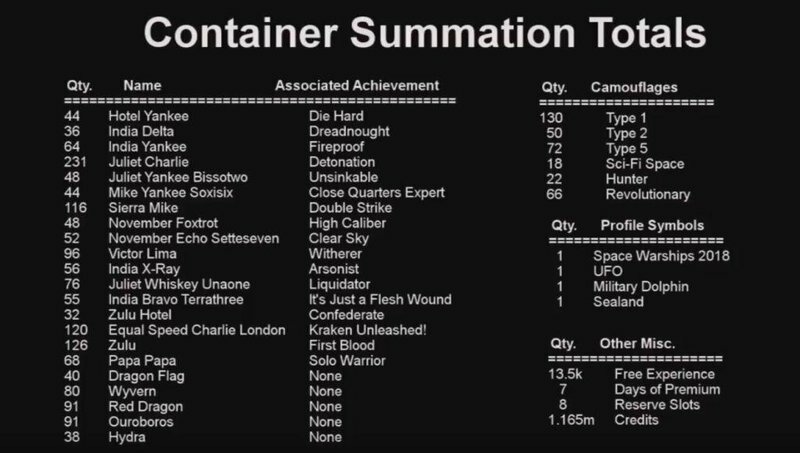 Some of the containers are purchased premiums, however most have been earned by missions for the past few months. I was hoping to get a radar upgrade, but no such luck. I hope you guys enjoy the video. WARNING: this is over 33 minutes long and there is no summary. Then by all means somebody summarize what they got in a nice list lol. I recently got a SuperContainer; 7 days premium ... can't complain. Guys at the end of the video is a summation count of all the container rewards. I thought I would let you know that fact. If the summary is anything other than, "not worth the time/money," I'd be surprised. So no Doubloons or ships out of 200 containers opened!? 33:05 is the summary. Interesting video, with a good sample size. Sorry. First, for not seeing the summary buried in there but at 5 minutes in I was toast. Second, for getting nothing of significant value. When loot crates are dangled in front of players as a reward it’d be nice to feel like you were rewarded. 200 crates represents a lot of time and, possibly, money to get stuff that you can get in the game for pennies. There is a summary at 33:04. But it isn't complete. I saw at least one mod go by (SC at 7:35) but it's not in this list. NO consumables?? And how were these crates obtained? All S&C choice, all aged out (i.e random)? How many collection crates? Consumables? I can buy those 24/7 when needed. You are right about the mod. The upgrade was an engine boost mod 1. I had that in my notes, but misplaced that for some reason in the final. Signals are important to me at this time because you can not purchase them in the game. All the crates were obtain. In regards to collection crates, there were 49 of them. For anyone who wants to watch the whole thing...YouTube can be set to 2x speed in the settings, right next to the HD selector. Sometimes you forget how to use the tools properly you are given. Good to know. Whether you value them or not, I'm surprised that you didn't track them for completeness. It would be nice to know their drop rate from S&C. Next time, too, you might want to separate out the collection crates in the summary. Currently I spam Consumables. Except for the Econ flags - which *can* be bought - I'm doing okay on flags. Again, thanks for doing this. The more data the better the science. I forgot about this setting, tbh. Anyway, thanks for the video. It was interesting to see.